While major safety projects on Queens Boulevard and Brooklyn's Fourth Avenue quickly advance with low-cost materials, Bronxites will have to wait years for a safer Concourse. Earlier this week, DOT unveiled plans for the fourth and final phase of its reconstruction of the Grand Concourse, which will cover a little more than a mile, from 175th Street to Fordham Road [PDF]. The project got a thumbs up from Bronx Community Board 5’s municipal services committee, but it’s not scheduled for completion until 2022. The long wait stands in contrast to similar projects in Brooklyn and Queens, which DOT implements quickly with paint and other low-cost materials before the more time-intensive capital construction process builds out changes with permanent materials. Similar to the design for phases two and three, the fourth phase of the Grand Concourse project will shift bike lanes on the service roads from the curb to the median, raising them above the grade of motor vehicle lanes. Motorists exiting the Concourse’s central roadway will have to come to a full stop before crossing the bike lane and entering the service road. The Grand Concourse is a major transit street and north-south connection for some of the most densely populated neighborhoods in the city. With wide car lanes, long pedestrian crossings, and high-speed slip lanes between the main roadway and the service roads, it’s also one of New York’s most dangerous streets. For two years, a coalition of community groups, churches, and elected officials has pressed NYC DOT for a “complete street” redesign of the boulevard including protected bike lanes, shorter crossings, and dedicated bus lanes. 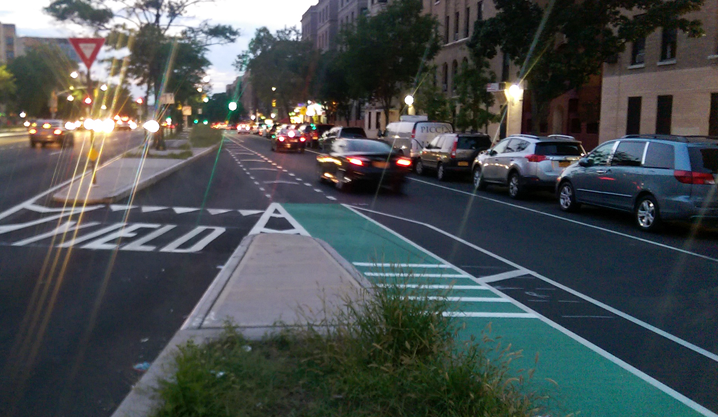 Last summer, in a preliminary version of phase two of the Concourse redesign, DOT realigned the bike lanes between 166th Street and 171st Street to the left side of the service roads and painted them green. The bike lane is less susceptible to getting blocked by illegal parking, but points of high-speed conflict remain where drivers transition between the main road and service lanes (above). But DOT has no plans to expedite the improvements by implementing a preliminary version with low-cost materials, as the city has done on Queens Boulevard, one of the de Blasio administration’s other flagship “Vision Zero Great Streets” projects. Instead, Bronxites will have to wait for the Department of Design and Construction’s notoriously slow and unreliable capital reconstruction process. Phase four is slated to begin construction in 2019 and wrap up a full three years later. Despite a broad, active neighborhood coalition to improve the Concourse for walking, biking, and transit, the city isn’t showing the same responsiveness on the Concourse as it has in Queens and Brooklyn. Each phase of the Queens Boulevard redesign, for instance, is implemented with low-cost materials the same year that DOT presents it. DOT also took care to improve its Fourth Avenue design in response to the demand for safe bikeways, which will also be built out relatively quickly with paint and striping. Given the breadth of support for bus lanes, Figueroa said he was disappointed that DOT has continued to overlook them in its designs. The bike lanes will also be vulnerable to encroachment since they’ll be on a mountable curb, and details about pedestrian improvements at intersections remain sparse. The city’s next presentation about the project will be on the evening of January 24 at the monthly meeting of Community Board 5, Davidson Community Center, 2038 Davidson Avenue. Ugh, just get rid of those diagonal express/local access roads. The mountable curb will do less to discourage parking and driving in the bike lane than plastic posts would. I can’t tell what’s going on with the planter side but expect a short vertical lip that will catch your wheel and take you down if you drift to the edge of the narrow bikeway. The mountable curb on West Street in Brooklyn provides no protection and ensures that the two-way “greenway” there is a de-facto parking lane. Same thing for the mountable curb in Times Square. So… after all this, there’s still nothing north of Fordham Rd? Has anyone tried biking Grand Concourse (I have). How about fixing it all the way to the end (Mosholu Parkway). Exactly. Skip the useless mountable curb and just add the damn posts. There has to be another phase, unless the city “forgot” that the Grand Concourse travels north of Fordham Rd. The entire GC redevelopment project is a failure IMO. A poor adaptation that is going to costs a fortune due to the capital costs but change little. The street should have been totally reimagined, considering it runs through some of the most densly populated neighborhoods in NYC. -The city should have first torn out all of those useless/inaccessible islands/medians and planters between the service road and mainline. -With a fresh canvas, sidewalks should have been expanded to allow for seating a beautification. You can add trees+planters within the new sidewalk space. -Two general traffic lanes in each direction. -Center running bus lanes with islands. No loading zone where the bus stops are located. Crosswalks and signals at these locations. -Red light cameras at all lights. This would be so much better. It seems like the city just tacked on some minor changes to a plain vanilla street reconstruction project. Pretty much. No real comprehensive plan here. The Bronx always gets the shaft in everything, and nobody gives a damn. We shouldn’t have to wait an eternity for something so damn simple! Concourse buses aren’t on DOT, MTA, or DeBlasio’s radar, despite being the 6th-busiest bus corridor in all of NYC (and that’s with only 6-days-a-week Limited service and NO OVERNIGHT SERVICE). Concourse subways? MTA cut weekend service in 2010, then responded to 6 consecutive years of ridership growth with another service CUT at the end of 2015, citing “loading guidelines”; meanwhile, good luck getting a seat on the D even at 5AM these days! This borough, and this city, are screwed. All we get are politicos whose pandering is so transparently hypocritical that one can’t – and shouldn’t – take ‘em seriously. Unless and until the Cross-Bronx Asthmaway is permanently deleted, and unless and until we get a network of dedicated bus and bike lanes, and DRAMATICALLY IMPROVED SUBWAY SERVICE, DeBlasio and the rest can shut the hell up with their posturing on “climate change”. The agency says a future capital project will add protected bike lanes on the Concourse between 138th Street and 161, but there is no funding or timetable attached yet. There is no low-cost, quick-build version of the project, however, so residents won't reap the safety benefits until capital construction wraps up in 2022 (at the earliest). DOT plans to build raised bike lanes along the medians on the Grand Concourse, but construction between 175th Street and Fordham Road won't wrap up until 2022 at the earliest. That timetable doesn't sit well with the Bronx residents who came out to Bronx Community Board 5 last night to demand faster action.